It’s been a great experience working with the Data, Analytics and Learning MOOC (DALMOOC) from EdX at https://www.edx.org/course/data-analytics-learning-utarlingtonx-link5-10x#.VJO6xF4AA. I’m so glad my boss found it and encouraged me to take it (Although I started only in Week 5 of the 9-Week course). It was not easy, nevertheless, it was a very rewarding experience. I would think an estimated 5 hours/week would not be sufficient to gain all the competencies, especially as the topics become tougher in the later weeks. I liked the overall design of the course where the contents progress smoothly, starting from a general introduction of learning analytics, getting started with data analysis to deeper topics like social network analysis, prediction modeling and text mining. Sadly, I jumped back and forth not following the flow, since I started late. But that’s the best part, because the course is designed to be flexible, as in, I can directly access topics which interest me the most, without a need to follow the order. I also liked the fact there were ways to create artifacts for future use and easy sharing, like my blog which I created exclusively for this course! The contents were good and aptly selected. There are deeper stuff in each of these topics, but this course provides the basic foundation, based on which we can explore further. I found Weeks 5 & 6 to be content-rich which was necessary to understand many concepts in Weeks 7 & 8. Activities with specific points allotted in Weeks 5&6 were good, I wish there were more in other topics to test our understanding (but better organized and with some tips).The voices from the field about different research taking place in this field are very useful bonus content. The ways to interact were well-planned and executed. The discussion forum was so useful and the students were eager to jump in to answer questions and help others. Connecting with twitter helped us to connect to instructors and other course mates with ease. I din’t have luck to go into the collaborative chat though. Along with the different options of connecting with social networks like Facebook and twitter (especially in Prosolo), I personally prefer to add in LinkedIn,Google groups as well. In terms of improvements that I would want to see in future courses, most of them are related to accessibility. Most available options, though explained upfront during orientation could be better organized. For example, the different contents in EdX that were in tabbed format were not much noticeable. I used to go to Prosolo every time to see all the contents since I thought EdX didn’t have them all (how stupid of me, lol). Another big difficulty when I first started using EdX is to identify which video I should see first in a chapter. I would often see one, and go to the next as given in alphabetical order and then realize that I should have watched the second one first. It would be good if the course contents are numbered and ordered that way! The option to download handouts was not given in all weeks, so giving that would help. Making the bazaar assignments more accessible would also help students. Rather than linking to en external assignment bank (which didn’t have all the weeks’ assignments), it would be better if it’s integrated within EdX or Prosolo. I discovered late that Quickhelper has two different options like Question and Discussion (A tip while hovering could help, maybe). And I didn’t know if I should post under each week’s course or the discussion forum link (I later came to know they both link to the same place). Probably, consider any one integrated place for all discussion? Of course, as our instructors talked about future plans, it would be good to see real-time analysis to check who stands where in the network and whom we should get connected to for better access. Those were some suggestions I could think of to overcome the difficulties I faced while taking this course. I think these would be definitely looked after in future courses. For the construction of such a course for first time, it is so well done. I’ve learned so much in so little time (miles to go, yet). Big appreciation to all instructors who put in so much time and effort to bring it together. Thank you so much! After toiling for days to learn, do assignments and acquire competencies, it’s now time to relax . And don’t forget to connect to peers. Happy holidays everyone! Competency 9.2: Integrate various course concepts through creation of a graphical representation (concept map) of the relationships between prominent course topics. If you are going to do it for the first time just like me, I would recommend you to read about concept maps from few articles (The links given in the course were useful). Competency 4.2: Describe and interpret the results of social network analysis for the study of learning. I’m going to use the analysis I did by extracting twitter data with hashtag #DALMOOC (explained in my post for competency 3.2) to interpret the results of modularity in the network. The density was 0.05 which means that the network is connected relatively well. There are a few sub-communities in the network, but still the overall network is connected to some extent. In the modularity report, we can see the formation of 13 communities. There are some disconnected nodes in the network containing lesser people/ single person which form smaller sub-communities. We should try to connect the disconnected nodes in the network to others in the bigger community to ensure good sharing of information. The giant component algorithm brought 5 main communities which are color-coded. From the centrality measures, we can see that dgasevic plays the role of a network broker by bridging many nodes in the network. The outdegree from that person is also high which means that he is involved in conversations with many people and is willing to help. Competency 4.1: Describe and critically reflect on approaches to the use of social network analysis for the study of learning. 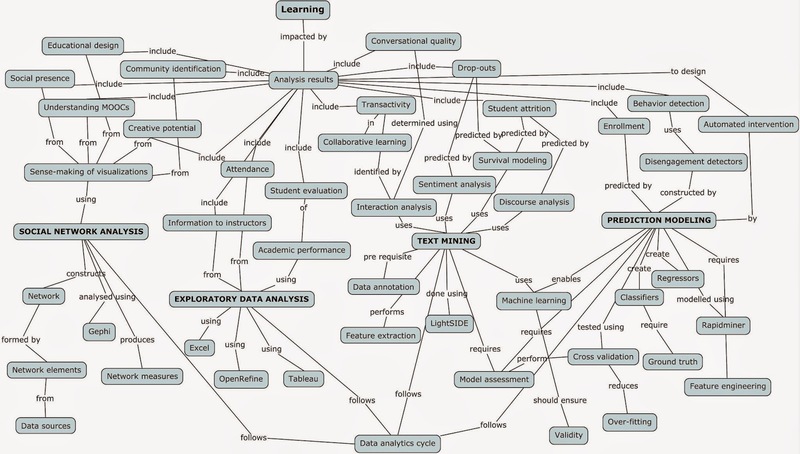 I’ve seen some great insights on how to use social network analysis to improve learning. The impact of social network analysis on educational constructs like learning design, sense of community, creative potential, social presence, academic performance and MOOC pedagogy looks promising. The possible data sources could be discussion boards, course enrollments, twitter and other social networks data, self-reports or course design. Metrics like network density, degree centrality, eccentricity, modularity etc. help us to get an idea about the network of and individuals in a network. Learning design could affect students’ activities in a big way. Students who are familiar with a design are generally more comfortable using it. To see if students in a course are learning as expected, we can monitor them using SNA and guide them as needed. We can see at what stage the instructor’s role is more important than peer-facilitation by seeing the interactions and provide help to students. Monitoring the sense of community will be useful in identifying isolated groups/ individuals who may not receive all information. We can in such cases guide them to be part of larger communities. We can also advise students to join new groups for assignments to get connected to more students. These factors can impact the creative potential, social presence and academic performance of students if suitable help is provided. Awareness of more ways of communication and their usefulness should be advocated to students to help them understand the distributed structure of MOOCs and be better involved. I would think that this kind of analysis should happen along the way in any course to see how students are doing in the course of time. Seeing the results at the end may not be of much help to students. Rather, positive measures can be taken like introducing new hashtags for better connection or introducing a list or shared document of all students and their resources will help students better in the rest of their course. It could be beneficial to connect different social networks to get the complete picture about an individual student as well. Competency 3.2: Perform social network analysis and visualize analysis results in Gephi. I did assignment 79 in which we are asked to extract data from twitter and analyse the twitter network in Gephi. I extracted twitter data using NodeXL, a freely available add-on to excel. I searched for all tweets with the tag DALMOOC and used it as my data set. I exported the data from NodeXL as a Graphml file which I then used to import into Gephi. I tried different visualizations and measures. I was pretty amazed to see what difference a good visualization can make in analyzing and presenting data 🙂 The snapshots should be quite self-explanatory. It was interesting to see the network graph color-coded by the geographical location (This is only a part of the whole network graph). The graph density was 0.050 and the diameter of the graph was 5. The modularity report is shown. There were 13 communities, some having single and two peers. It was very interesting to apply different visualization techniques to our course data. Hoping to use these types of visualizations on my own research data! I’m going back to Weeks 3 and 4 to learn about Social Network Analysis since the course is nearing completion. I will go back to the final wrap up Week 9 after I finish these two weeks’ lessons. Competency 3.1: Define social network analysis and its main analysis methods. Social Network Analysis (SNA) provides insights into how different social processes unfold while learning happens in any learning environment. It helps us to study the effects of interaction and social context in education. The different network elements are actors and their relations. The nodes/ actors could be students email addresses, tweets or any such actions. I would typically use SNA to see the interaction between students, for example in a chatroom/ discussion forum, to see who is talking to whom, who replies to whom, who is following what question, who voted for a question etc. Based on the interaction patterns, we can construct the network graph. We can from here see if any measure from the network can correlate to learning or performance. Diameter determines the longest distance between any pair of nodes in a network. It measures the extent to which each individual node can communicate with any other node in the network. Density determines the potential of the entire network to talk to each other. It can be used to determine the extent to which some individual nodes share the information. The spread of information is very fast in a highly dense network. Degree centrality is a simple measure that indicates the overall number of connections for each actor in a network. Network measures may have specific meaning when considered in the context of directed graphs. In-degree centrality is a measure of the number of other nodes that directly try to establish connection to a particular node. Also refers to the popularity or prestige of a node in a network. Out-degree centrality is the measure of the number of nodes to which particular nodes are talking. Betweenness centrality indicates the ease of connection with anybody else in the network, in particular, to try to connect all small sub communities in the network. Brokerage role is best measured by this measure. Closeness centrality measures the ease or the shortest distance of a node to anybody else in the network. It indicates how quickly a node can get to another node in the network. Network modularity is used to identify common sub-groups talking to each other where a group of actors have close ties to each other. An algorithm for finding the giant component can be used to identify the largest component of all connected nodes in the network. This filters out single nodes that are not connected to the network to easily identify and analyse communities in the network. Competency 8.5: Examine texts from different categories and notice characteristics they might want to include in feature space for models and then use this reasoning to start to make tentative decisions about what kinds of features to include in their models. I tried the Bazaar activity in Prosolo (but my myself since I didn’t get matched to a teammate), to explore advanced feature extraction in LightSIDE and see which features work well giving better performance. I first used the sentiment_sentences data set and configured stretchy patterns using the pre-defined categories positive and negative. There was a very significant improvement in performance from unigrams only to stretchy patterns. To look at the details, I used Explore results pane to analyse the results. In the newsgroup data set, there were overlaps in some categories like religion & atheism, forsale & windows due to some words. The context should be captured more in such cases using stretchy patterns. In my test data set of plants classification into fruits, vegetables and flowers, it was seen the the unigram features were most predictive. The structure of the text was not of importance since the unigrams feature space did a decent prediction than bigrams and trigrams included. Competency 8.3: Compare the performance of different models. Competency 8.4: Inspect models and interpret the weights assigned to different features as well as to reason about what these weights signify and whether they make sense. I went to the Explore results tab to do some basic error analysis. The confusion matrix of 123 grams model was better than the 1 grams model. I looked at specific features in detail that predicted wrong categories. The data set was very small, so it did not have enough features to train the model on. There were many wrong predictions in the case of punctuation features as well. I guess that the model would do well when trained with more data using unigrams, bigrams and trigrams. Competency 8.2: Build and evaluate models using alternative feature spaces. I used the different feature spaces that I saved in the previous exercise for building models. My data set was very small and I intended to use it just for testing. I found significant improvement in metrics while comparing the models of POS features Vs Unigrams and bigrams. I could see from my data that the n-grams were most predictive of the categories. To test with a real data set, I tried the hands on activity of text feature extraction given in Prosolo using sentiment_sentences data set. I extracted different feature spaces from the basic feature set and used logistic regression. There was significant improvement while expanding the feature set. Competency 8.1: Prepare data for use in LightSIDE and use LightSIDE to extract a wide range of feature types. I loaded my input csv file into LightSIDE and extracted basic features like unigrams and bigrams first. Then I checked different basic features and extracted their feature sets. I saved all the feature sets for building models later using alternative feature spaces.